We flew from Cape Town to Johannesburg, then took an international flight to Kenya. Two hours for the first flight and another five to Nairobi, with an extra hour lost to time zones. 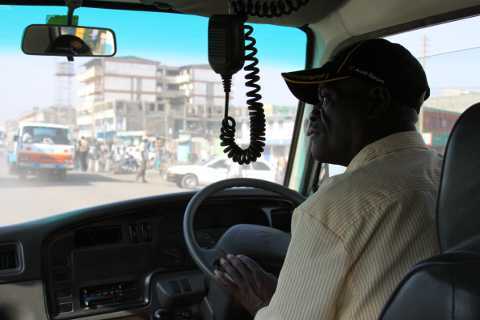 Onesmus Lioni, our driver, met us at the airport and took us to the Nairobi Intercontinental hotel. In the morning, Onesmus took us through Nairobi then out into the country. Our destination: Amboseli National Park, at the foot of Kilimanjaro. This view is typical of Nairobi, but the road got quite a bit rougher after we left the city. 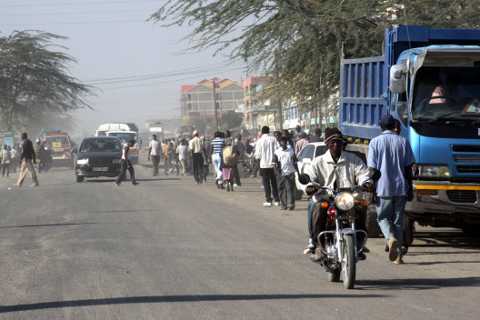 The ride to Amboseli is about four hours, but we stopped in the little town of Kajiado on the way. There, we visited the AIC Girl's boarding school. 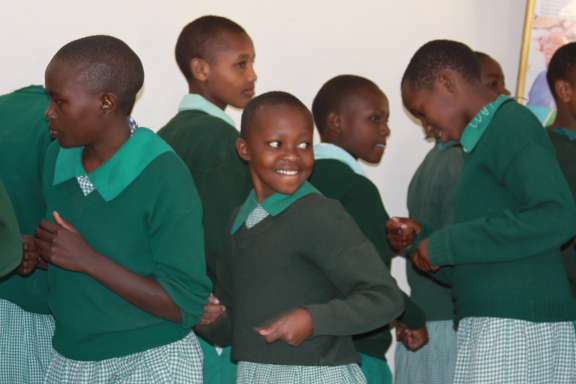 This photo shows some of the girls welcoming us with song. In this area, marriages are often arranged when the girls are young. This school has a rescue program for the unwilling brides. They go to the school instead of to the wedding. 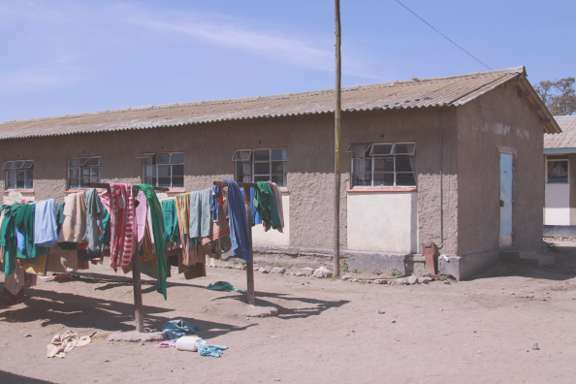 This is one of the dormitories where they live. 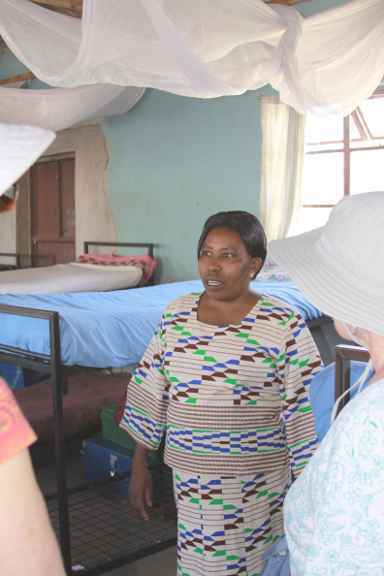 Inside the dormitory, teacher Zipporah Nganga is telling our group about female circumcision. When the person most trusted by a young girl, her father, subjects her to such torture, a girl often becomes withdrawn and isolated. Other forms of abuse are also common, and such victims live at the school full time. They don't even go home for holidays. 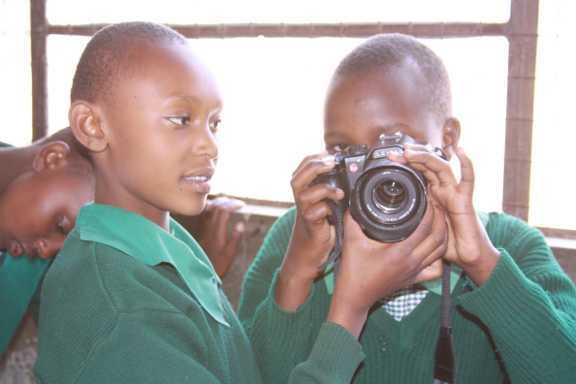 Our tour guide, Chris, has handed his camera to some girls and he is showing them how to take pictures. The girls liked seeing themselves in the camera LCD when I was the photographer, but they were all giggling and joining in when I gave them my camera and let them pass it around. 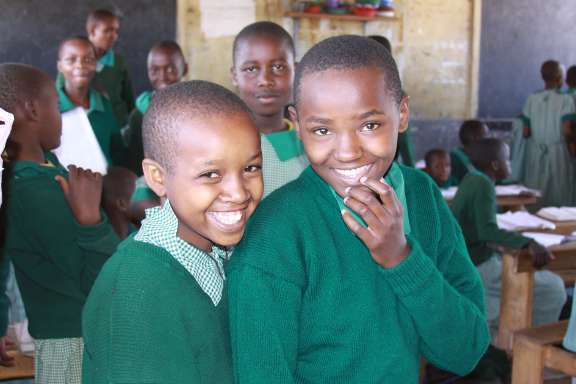 School policy is that all the girls must cut their hair close, because they had been spending far too much time on fashion rather than their studies. Mingling among the girls, Christina was suprised to feel a single strand being pulled from her head. Turning around, she asked if the girls would like to feel her hair. She was immediately overwhelmed, and Bob Anderson got this shot shortly afterwards. Thanks Bob! Last shot as we left their classroom. I think the girls enjoyed our visit!